Frustrated by your twine always being in a tangle - thanks to the pull through string tidy this Big Tin of Twine is always tangle free! 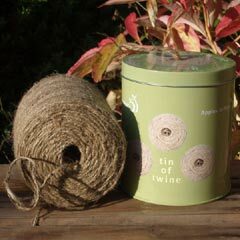 A handy garden essential this contains 120m of natural jute twine which comes in a handy reusable tin. Our community of gardeners have a wealth of experience, beautiful garden and great photos, discover more on the following pages: greenhouse.